Blurb: An Ideal Wife ---- Beware of what you wish for. What happens when the technology savvy Dwarf God, one the driver of the Biggest God in Heaven, sets out to find an ideal Wife for a man on earth? Seems like a simple thing for a god to handle, right? But there is the catch – God has never created a girl with all the qualities this man, Sameer, wants in his Ideal Wife. And now, to make matter worse, Dwarf God has to do it without using his divine powers. Will he be able to find the girl? Will she be an Ideal Wife for Sameer? Disclaimer: You can’t blame the author if you get married after reading this. 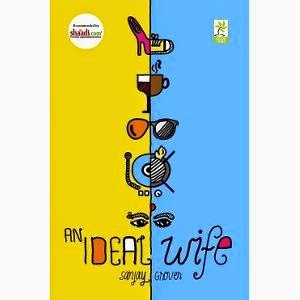 Verdict: ‘An Ideal Wife’ is the debut novel of Sanjay Grover. Can you imagine a man is writing a book named Ideal Wife but this author has chosen this subject for his debut work. The name in itself gives the hint that this book is going to be interesting because how can a Wife be ideal and that also for a man. The cover looks bright with the perfect color combination of gorgeous yellow and soothing blue. The funky font on the cover gives the book the perfect flavor needed for a humorous book like this. I love the first appearance of the book which will definitely create an urge among the readers to know what the author has to offer. The story is a brilliant outcome of the author’s imagination. The story starts in heaven where a Dwarf God played his story of how he earned respect after getting the post of god on his retirement day in front of aspiring gods. The dwarf god came in to earth to help one of his atheist devotee name Sameer to help him find his Ideal Wife and trapped himself in a promise. Sameer, basically a good guy gained a habit of winning bets and landed himself in a bet with one of his colleague to find his Ideal Wife within a year. The list that contains the quality needed in his Ideal Wife make the technology shrewdness Dwarf God gasp for breath. But he has to find the girl for Sameer because God cannot break his promise. The story takes an interesting turn when Sameer gets married to his Ideal Wife and makes another bet to be happy for one more year with his wife. Why the author uses the tagline of ‘Beware what you wish for’? How can a god be landed up in jail? And did Sameer finally win the bet? To know these answer one must read this book. The author has adopted a funny narrating style. His one liners and efficiently written anecdotes will make the readers enjoy the whole journey of searching the ideal Wife for Sameer. The characterization was good but I felt a few more descriptions will help them become visible to the readers. I felt the end can be a bit more interesting and has been written in a hurry. The way the book started and goes till the end, the reader’s expectation will grow for the ending. But the ending was not up to the mark. Few editing errors are also spotted here and there which can disturb the flow of the story. Overall I enjoyed reading it because of its different plot and funny writing style. Final Words:Sanjay Grover in his debut work has presented a different plot which will definitely attract the readers. I appreciate the author for offering such a wonderful message through such a humorous storyline.